After the EUR/USD made a move above $1.2400, the Technical Confluences Indicator shows the next areas of resistance on the way up. 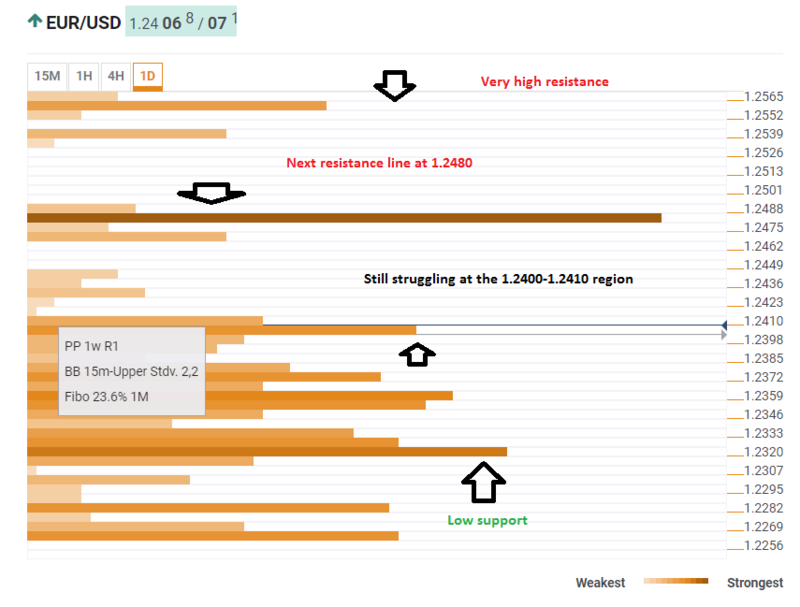 There are very few areas of congested caps between the current trading levels and $1.2480. Up there, we have a convergence of the one-month high, the Pivot Point one-day R3, PP one-month R1, and the PP one-week R2. All are strong lines. Beyond this line, $1.2555 is the apparent barrier as the 52-week high and the highest level in over three years. However, the pair is still struggling to confirm the move above $1.2400 and for good reasons. The $1.2400-1.2410 area the pair is struggling with is packed with significant technical lines: the SMA-5-15m, the Pivot Point one-day R1, the Bolinger Band 15m-Upper (Stdv. 2.2), the Pivot Point one-week R1, the Fibonacci 23.6% one-month, and more. A failure to hold onto these gains may send the pair down to the $1.2360 region were we see the confluence of the SMA50-1h, the SMA100-1h, the Fibo 38.2% one-month, the SMA10-4h, the BB 1h-Middle, the Fibo 61.8% one-day, and the SMA-5 one-day.